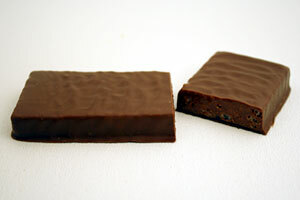 The first product that I tried was the salted peanut praline bar. I shared this bar with my mom when I had to drop her off the other day. We both liked this bar. It had a strong peanut butter flavor and some crunch. The next product that I tried was their PB and J Bonbons. 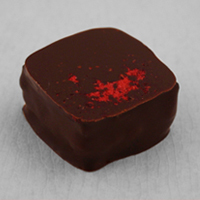 They are small pieces of chocolate with raspberry and soft peanut crunchy praline. My husband and I were both fans of these. The raspberry was a bit chewy which was a nice mix of texture from the rest of the piece of candy. I like that they are so small which makes a great after meal treat. My other favorite product that I tried was the pretzel dragee. Usually when you have pretzels covered in chocolate, they have a thick chocolate layer. I usually peel off about half of the chocolate on them because it is just too much for my preference. This pretzel dragee is different. 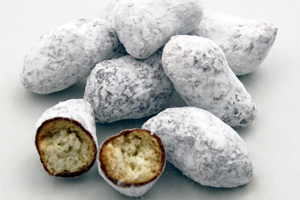 It is a pretzel nugget lightly covered in chocolate and dusted in powdered sugar. It is the perfect amount of chocolate. You can really taste the saltiness of the pretzel. I am a huge fan of salty and sweet together so these were awesome. These chocolates are unique and tasty. They would make a great gift for someone this holiday season.